There are advantages to specialized breeding and genetic engineering of the poplar trees destined for biofuels, including the potential for drought-resistance or lower lignin content in the wood. However, there is concern over gene flow, i.e. pollen and seed movement, from hybrid or genetic-engineered trees to native poplar populations. Typical poplar pollen on the left, poplar with its flowering gene “turned down” on the right. 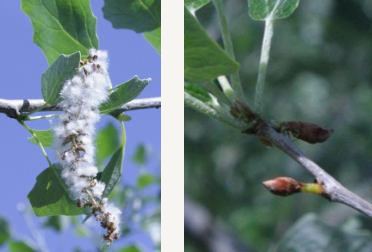 To address this, AHB researchers from Oregon State University developed techniques for controlling the ability of poplar to spread through wind-born pollen and seeds. Using a classic technique known as RNA interference, AHB researchers successfully “turn downed” a key gene that controls flowering in poplars. They also tested a new genome editing technology called CRISPR-Cas9, which is inexpensive, easy to use, and allows permanent changes to genes of interest. NOTE: The hybrid poplars at AHB’s demonstration sites are not genetically engineered. They were bred using traditional techniques of controlled pollination. Watch this webinar about progress in the field of genetic engineering of trees, including what AHB’s work means for biocontainment of GE and exotic trees to facilitate public and regulatory acceptance. Read these newsletter articles on controlling poplar reproduction and on environmental sustainability.